Fun Football is held every Saturday at the J.S Blatter Football Complex from 9.00am to 10.30am – for all children between the ages of 6 and 14years. Registration is free. The response from parents and children has been excellent. Last Saturday, over 30 children participated in the programme. Parents are also encouraged to take part in the activities as a fun start to the weekend. “Fun Football is about developing football skills at an early age. It’s also a great way of combating lifestyle diseases in children and so I encourage all parents and their kids to join in on the fun,” said Frederick Young, CEO Designate of FFS. 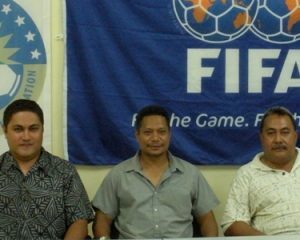 Coordinated by Technical Director, , Fun Football is in line with the FFS vision of developing Samoan football; beginning at grassroots level. To add depth to the programme, FFS have also enlisted the talent of our national representatives who volunteer to run sessions with various age groups. Fun Footballers learn football tricks as the players share their love of the game. “We want the kids to see them as role models,” said Lui. 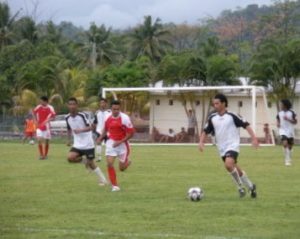 FFS is also preparing for the commencement of its National Youth League (Under 15 years) on Saturday 20 February.